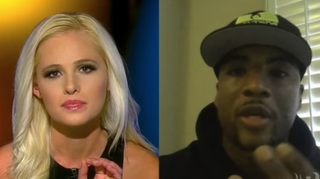 Blaze TV host Tomi Lahren felt the wrath of the Beyhive and Power 105.1 radio host Charlamagne tha God after not only criticizing Beyoncé’s Super Bowl performance but also comparing the Black Panther Party to the Ku Klux Klan. “Your husband was a drug dealer. For 14 years, he sold crack cocaine. Talk about protecting black neighborhoods—start at home,” Lahren said of Beyoncé. In response, Charlamagne labeled Lahren his “Donkey of the Day.” He then received an invite to appear on her show earlier this week. Apparently, Lahren thought she’d be able to handle her own against the radio host. She was quite wrong. “All right, Charlamagne, please tell me, why was I your Donkey of the Day?” Lahren asked. It was then that the two went head-to-head on matters such as the Black Lives Matter movement and the Black Panther Party. “I think about the quote that Dr. Martin Luther King Jr. said when he said, ‘An injustice anywhere is a threat to justice everywhere.’ As an American, we’ve been seeing the different injustices that have been happening with the police and unarmed Americans in America. For Beyoncé to speak out against that and have a video where in the video she’s saying, ‘Stop shooting us,’ I don’t see how anybody could have a problem with that. Like, if you have a problem with Beyoncé saying, ‘Stop shooting us,’ then that must mean you agree with them shooting us,” Charlamagne stated.